One of the rare Korean courtroom movies that is embodied with many clever dialogues. “Unbowed” is a legal drama film, written and directed by Chung Ji-young and starring Ahn Sung-ki and Park Won-sang. The movie is based on the true story of Kim Myung-ho, a math professor who was arrested and prosecuted for shooting with a crossbow the Judge Park Hong-woo. The movie starts with the aforementioned incident. We witness a math professor named Kim Kyung-ho (Ahn Sung-ki) holding a crossbow in front of the building’s entrance of Judge Park Bong-joo’s (Kim Eung-soo) home. When Judge Park Bong-joo arrives at his home, Kim Kyung-ho confronts him and threatens him with the crossbow, demanding an apology for not following the law. The two men start to fight and Kim Kyung-ho is arrested and prosecuted for allegedly shooting Judge Park Bong-joo. After these events, Kim Kyung-ho's wife (Na Young-hee) finds Lawyer Park Joon (Park Won-sang) following her husband’s request and asks him to represent her husband in the court. From their meeting we learn that in 1995, Kim Kyung-ho pointed out a mistake that his colleague made in a math question of their University’s entrance exam and he wanted to disclose the error to the students. But the University’s representatives had different thoughts, a dispute has arisen and the next year the University denied Kim Kyung-ho’s full-tenure despite being a brilliant professor. Kim Kyung-ho after also losing a legal battle with the University, he migrated to the United States. But when he learnt from the newspaper that a new law has passed that allows rejected professors to apply for re-evaluation and proceed to lawsuits for wrongful professorship dismissal, he returned to South Korea. For one more time he lost the lawsuit and in 2007 he proceeded to appeal, but Judge Park Bong-joo he defeated Kim Kyung-ho's appeal and this led Kim Kyung-ho in front of Judge Park Bong-joo’s house, holding the crossbow. During the above conversation, Kim Kyung-ho's wife notices Lawyer Park Joon’s alcoholic tendencies and changes her mind for appointing him. 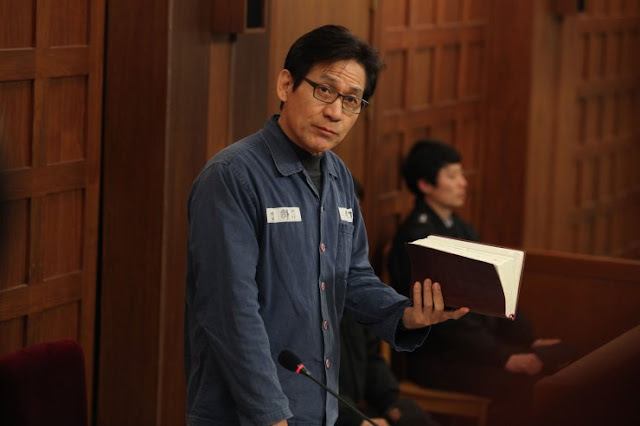 Regardless, Kim Kyung-ho's trial for injuring Park Bong-joo proceeds with another lawyer, but Kim Kyung-ho frustrated by the judge he objects the trial and fires his lawyer. Now being in prison, he files for another appeal with a new lawyer. This new lawyer is non-other than Lawyer Park Joon who was recommended by Journalist Jang Eun-seo (Kim Ji-ho) to Kim Kyung-ho's wife. The two men, despite their initial ideological differences, fight together to prove that Kim Kyung-ho did not shoot the crossbow. The math Professor Kim Kyung-ho from the first moments of the film and all its duration appears to be utterly rightful and follow the rules. In these terms, it comes as a surprise how this uptight professor chose to frighten the judge using a crossbow and not try to from the beginning to find his right by following the law. Only later he appears to extensively study the law, showing how meticulous he is. The Chung Ji-young’s directing and the editing by the duo Kim Sang-beom and Kim Jae-beom really stand out in the scenes where the camera rapidly shifts during the trials from one person to another and in this fashion they enhance the tension. Furthermore, Ahn Sung-ki is very good in his role as Professor Kim Kyeong-ho and he won several awards as best actor. Still, the one that stands out with his natural acting is Park Won-sang as Lawyer Park Joon. 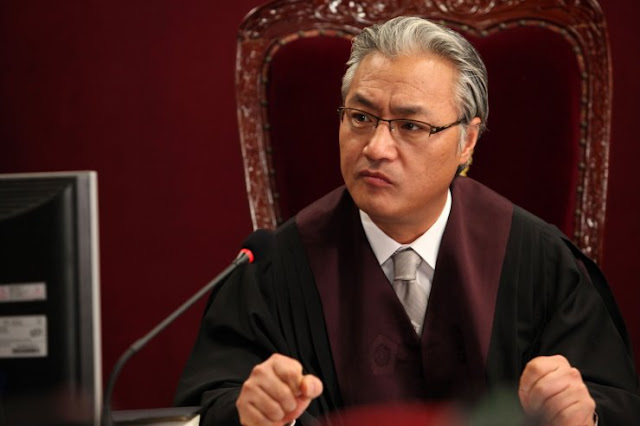 He is exceptional and shines both in the courtroom as determined laywer and outside the courtroom with his funny scenes. “Unbowed” is a film fairly without surprises minus one scene in the cell. This rough scene catches the viewer by surprise and seems misplaced to take account the general aesthetics of the film. It feels as its only purpose is to add the sock factor. Nonetheless, “Unbowed” is one of the rare Korean courtroom movies that is embodied with many clever dialogues and this makes it a worth-watching movie.